Ships Which Brought Our Ancestors to America is an ongoing project of Betty Miley Ashley. Information is from various sources including: ship passenger lists, family records, petitions for naturalization, and censuses. These are records for Lower Jeruslan people and their relatives. If you have information to add or corrections to make, please contact Betty. I have gone through the records collected over the years since I first began corresponding with those of you who were born in the Wiesenmuller area and those of you who are descendants of the immigrants. The earliest record found in my files was from a descendant of Johannes BEHRIG who was 49 years old in December 1876 when he and his family traveled on the SS City of Richmond to New York City, NY. Just a few months before that the first large group of Volga Deutsch from Kratzke, Saratov, Russia, had journeyed to Russell, Kansas. Among that froup were many relatives of our Wiesenmuellern and their neighboring villages. 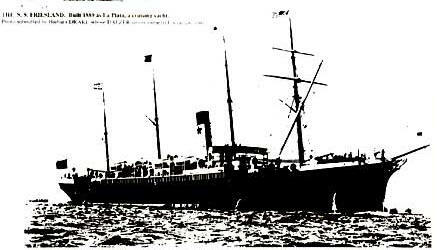 The last family I have records of (who arrived in America before most migration closed down completely from Russia) was the family of Adam PINNECKER which arrived in 1926 aboard the SS Albert Ballin. Saale, Rugia, Elizabeth Rickmers, Southwark, Missler, Phoenicia, Letonia, Augusta Victoria, Celtic, Cretic, Noordam, Frankfurt, Sicily, Ivernia, Canada, Merion, Caronia, friesland, Lusitania, Franconia, California, Eisenack, Main, Montclair, Thuringia. Webmaster Note: Since 1998 Betty has added much more information, as seen below. Johannes BEHRIG 49 (from Wiesenmüller to KS; parents Heinrich and Sophia, nee HEZZEL, BEHRIG / BARRETT. He married Marie MILLER); Johannes 23 farmer; Anna Lisbeth 21 spinster; Eva 19 spinster; Susanne 14 spinster; Heinrich 7 child. More information from Merlyn Niedens: This Johan Niediens (Niedens) is my grandfather, Henry Niedens' brother. John's obituary indicated that he immigrated to America in 1887 and settled in Russell Co, KS. The 1900 federal census found him farming in Wheatland township, Barton Co, KS. His brother, Fred, was also living in this township at this time. Later, he moved to and farmed in Rush Co, KS. About 1930, he retired and lived in Bazine, KS until the time of his death 16 Apr 1940. My sister recalls that our grandfather who also lived in Bazine would frequently visit John. Henry, Fred and John Niedens left Russia at about the same time. Henry and Fred arrived a few days before Christmas, 1886, and settled in Marion Co, KS. The oldest brother, George, the mother Marie Katherine Niedens, nee Keil and sister Anna Niedens Schneider arrived lated in 1891 and settled in Marion Co, KS. Henry, John and Fred Niedens were sons of John Adam and Marie Katherine Neidens nee Keil. Merlyn knew very little about his grandmother's family, Marie Nieden nee Pinnecker. She had at least one sister married a Philbert and lived in Bazine, KS. John Adam Niedens , the father of Henry, apparently died and was buried in Russia. His wife, Marie Katherine, came to America and lived in Marion Co KS. It is thought that she died 1896. John never did live in Marion Co and was living in Barton Co in 1900. Merlyn has found the gravesite of Maria Katherine Niedens nee Kiel. This great grandmother had been listed as a witness to Merlyn's father's baptism at the Zion Lutheran Church at Hillsboro, KS. She died on April 28, 1898 at age 68 yrs, 3 mos, 6 days. Probably born 22 Jan 1830. Merlyn's grandmothers (Maria Niedens nee Pinnecker)Elizabeth Pinnecker Filbert was born Gnadenfeld, Russia on 23 Feb 1868 and died Larned KS on 2 Mar 1944. In 1889 the family immigrated to Mexico and after enduring extreme hardship for several months moved to a farm 4 miles south of Russell KS. On 3 Oct 1891 she married August Filbert. In the obit the following children were listed: Marie Clark of Denver CO, Anna Hartman of Kighton KS, Martha Foos of Kighton, August Filbert of Bazine KS, Pauline Kleveno of Bazine KS, Bertha Kuehn of Englewood CO, Jacob Filbert of BAziine KS, Dorothy Ely of Bazine KS. The obit did not mention that her parents were Karl and Katherine Pinecker or a sister who might have lived in OHurray. More information from Glenn Sitzman: Catherine (Pfeiff) Siegfried was my Grandmother Sitzman's older sister. One of their daughters told me in the 1970s that Jacob Siegfried was born in Germany but married Catherine Pfeiff at Frank, Russia, where she was born 1864 (died 1931). Jacob was born 1856 and died 1907. The son Jacob was born from a wife who died; whether the first wife was born in Germany or Russia, I do not know. The family emigrated from Frank and settled at Mountain Park, Oklahoma Territory during one of the "runs." More information from Glenn Sitzman: Adam Schaefer was my maternal grandfather. He was born at Eckheim 16 Jan 1866 and died Clinton, OK on 4 Apr 1949. He met my grandmother in Lincoln, NE soon after she arrived in April 1890 and they were married at Lincoln on 7 Dec 1890. They moved to Denver soon after their marriage and in 1903 moved to western Oklahoma Territory. More information from Glenn Sitzman: John Sitzman who married Marie Rohrig was born at Frank on 1 Apr 1881 and died at Greeley CO on 1 Aug 1967. On 10 Oct 1901, at Lincoln NE, he married Marie Rohrig who was born Wiesenmeller 8 July 1882 and died Greeley CO 17 Aug 1970. John was the son of Georg Zitzmann (1833-1887) and Catharina Reuter / Reiter. Marie was the daughter of Jacob Rohrig and Katharina Lich. The above portion lists the Rohrig family as they cam through the port in Galveston in 1898. Jacob, the eldest son, is also listed here. However, Jacob arrived in Lincoln, Nebraska, 6 years earlier. If one looks at the actual ship's manifest, one finds that the family is going to Lincoln to Jacob Rohrig (who has also paid for their passage). In addition, I've found Jacob Rohrig's name listed in the Lincoln City Directory as early as 1893. Here is what happened with Jacob. He was 19 years old and about to be drafted into the Russian Army. My grandfather always explained it that he stowed away aboard ship and had left home in a hurry. My great aunt, Emma, Jacob's only living daughter, has told me that her father immigrated with a Lich uncle. Jacob's mother was Katharina Barbara Lich. I have found the family of a Christian Lich on the ship's manifest of the SS Ems, which arrived in New York, April 26, 1892. At the end of the immediate Lich family is a "Jacob Lich," age 19. I can't prove it but I strongly suspect this is Jacob Rohrig. In the 1893 Lincoln, NE city directory, Christian Lich is listed as living near the intersection of West J St., and 1st, and Jacob "Rarig" is listed as a boarder at the same house. (Several editions of the city directory had trouble spelling his last name)." "Jacob's first wife was Maria Katharina Betz (or as the family knew her--Maria Katrina). Jacob and Maria Katrina were married in Lincoln in 1895. Their first daughter, Pauline, was born in 1897 in Lincoln. Among other occupations, Jacob built houses in the neighborhood. By 1907, he was involved with the building of the Friedens Lutheran Church at 6th and D in Lincoln. I have a photocopy of a few pages of the dedication ceremony which lists him, along with his picture, as the Baumeister of the building project. Then he moved to a farm near Holly, Colorado. Maria Katrina died in chidbirth in 1912. At that point there were 8 surviving children. In a few months time, Jacob re-married. His second wife was Anna Marie (Sauer) Schreiber, who was a widow with 3 surviving chldren. Six more children were born in Holly before the family moved to Greeley, Colorado, where Jacob and Anna Marie died." John George BRICK b 13 Nov 1875 Laub; Amalie (nee KINDSVATER) (they married 12 Feb 1901); Peter b 16 Jan 1904 Wiesenmüller; Alma Augusta Victoria b 7 Feb 1907 aboard ship. Heinrich BUXMAN age 38 going to Otis KS; Christina age 37; Heinrich age 15; Jacob age 5; Marie; Amalie age 6 months; Friedrich BUXMAN age 34 going to Otis KS; Marie age 25; Johannes age 3; Friedrich (born at sea - probably s/o Friedrich above) NOTE: these names crossed off ship's manifest because of trachoma and whether they ever arrived at their destination is unknown. They were all from Wiesenmüller. Sophia KINDSVATER b 16 Dec 1893 came single & later married George FREIDENBERGER in 1912 Otis, KS. Andrew KINDSVATER b 6 Jan 1884 Dietel came single, married Marg. Eliz. BATT & lived Hardin, MT; Jacob KINDSVATER b 2 May 1886 Dietel came single & married Eva Elizabeth HILTERMAN & returned to Russia. Johannes JEKEL (going to brother Fred JEKEL, Hoisington, KS. Stated father was Johan JEKEL); Amalia JEKEL. David STRECKER (going to Hoisington KS; sponsor Fred NUSS); Anna M; David age 2; Heinrich. Fredrich SIEGRIED (going to uncle in Hoisington KS); wife Amalie; Katarina E, age 13. Henry PENNECKER b 24 Dec 1876 Alt Weimar; Marie (nee PENNECKER) b 31 Mar 1882 Wiesenmüller; Adolph b 3 Sep 1910 Wiesenmüller. Heinrich Jacob JEKEL 36; Heinrich JEKEL 34; Christian DINGES 26; Johannes DINGES 28; Katherina DINGES 28; Christian DINGES 9 months; Alexander MOOR 18; Johannes PRUSS 22; Christian GIES 31; Johannes MICHEL 26; Heinrich WEBER 30; Johannes MICHEL 26; ALexander BRETTMAN 43; Alexander BRETTMAN 17; Jacob BRETTMAN 28. All except the BRETTMAN family were going to Loraine, OH; the BRETTMANs remained in Baltimore. Emmanuel NAEB b.27 Sep 1864 Kraft, Russia; Mary Elizabeth BUXMAN b.13 Nov 1871 Wiesenmüller; Mary Elisabeth NAEB b.30 May 1900 (married a SCHWAB); Amelia NAEB b 12 Dec 1904 (married a SCHISSLER); Reinholdt NAEB b 12 Jan 1907. Maria Elisabeth (MILLER) KINDSVATER b 10 July 1858 Dietel, widow of Georg Peter KINDSVATER b & d Russia. She is the mother of Georg Peter Jr listed below.